Thursday, 9/8: 9:45 - 11:00 am, donations class, "Movement as Meditation"
Calling all yoga and wine lovers! This brand new event is sure to bring out the yogi in all of us! Event is on Thursday, September 8th. Event begins at 6 pm with check in. During check in you will pay and choose your glass of wine. The yoga class beings at 6:30 pm outside, ending at beauftiful sunset. *Event will be held inside Great Hall if raining. Tickets are $15, $10 for In Balance Yoga members and anyone under 21. Tickets include the yoga class, 1 glass of wine, and light snacks. *Yoga mats not provided. Thank you In Balance Yoga for helping make this event something special! 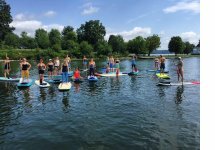 Check the webscheduler here for more information on upcoming community classes and community acroyoga. 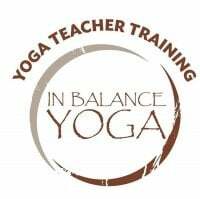 Interested in our next Yoga Teacher Training 200 Hour Foundational Course? Click here for more information. Program will begin in January 2017, six month format. Faculty include: Jeanmarie Paolillo (sequencing), Akke Hulburt (Anatomy), Chris Pohowsky (Anatomy), Lynn Theodose (Philosophy), Graham Schweig (Philosophy) and Nicole Boyle. In Balance Yoga is excited to announce that we will have Itsy Bitsy Yoga the third Sunday of each month from 3 - 3:50 pm. Next class Sunday, 9/18. Yoga® method developed by Helen Garabedian, our classes promote parent/baby presence and bonding. Help your baby to sleep longer and better, and provide helpful tips to calm fussy or crying babies. Join us on Sunday, October 2nd, from 3 - 3:50 pm for Yoga for Toddlers. Breathe, bend & bond with your toddler! A fun-loving, supportive, and active yoga practice filled with dozens of Itsy Bitsy Yoga® poses designed just for your toddler. At a time when children naturally explore movement, Itsy Bitsy Yoga® builds confidence in their moving bodies, and encourages their creative spirit both in and out of class. 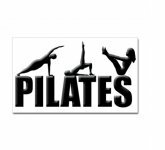 Try our mat pilates class with Jennifer the first Wednesday of each month from 3:00 - 4:00 pm. Next class Wednesday, October 5th. Jennifer is a STOTT pilates certified instructor, ACE certified personal trainer and also certified in the Pink Ribbon Program (post-operative workout enhancing recovery). Her class will include a brief introduction to the 5 basic principles used in STOTT pilates and a mat pilates workout. Drop-in to attend. Limited to 20 people. 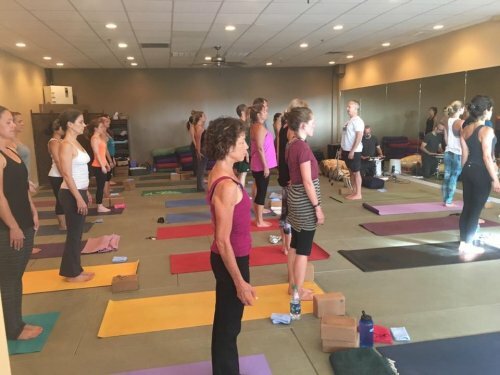 What is Slow Flow at In Balance Yoga? "Slow Flow is a slower type of flow (vinyasa) yoga, in which the movement is synchronized with breath in a smooth, flowing way. Ranging from a gentle and therapeutic pace to a mildly vigorous practice, you will be calmly challenged and energized in this class. As you flow through powerful, graceful sequences at a slower pace than regular flow classes, the focus turns to building and engaging your strength and concentration. By moving slowly and holding postures for several breaths, you will build strength and increase flexibility through slow, focused movements, allowing your body to deepen into a stretch or pause in strengthening poses." 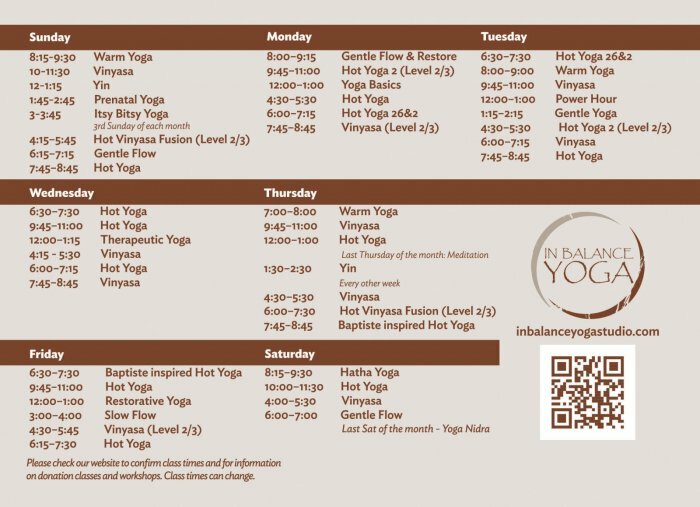 What is Hot Yoga inspired by Baptiste at In Balance Yoga? Hot Yoga inspired by Baptiste Power Yoga is a rigorous and meditative vinyasa practice with the room heated to 95 degrees. While challenging students physically, the teacher infuses the class with active self inquiry tools to encourage students to experience new possibilities in their lives. 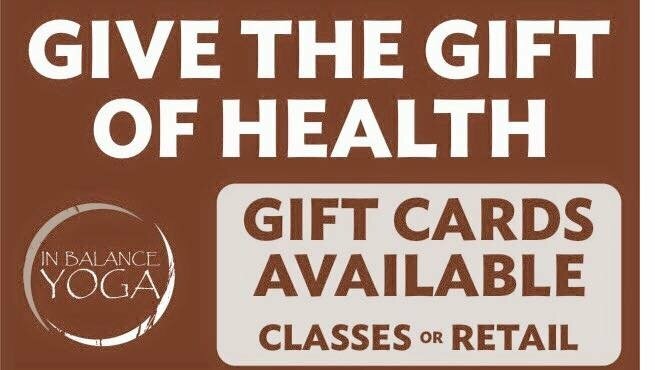 Classes inspired by Baptiste Power Yoga encourage modifications and are taught with an emphasis on clear directives. As a result the class is designed to be accessible to everyone, regardless of fitness level, age, experience or background. Offered on Thursday, 7:45 - 8:45 pm and Friday, 6:30 - 7:30 am with Bethany! 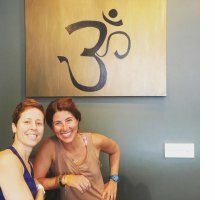 What is "Warm Yoga" at In Balance Yoga? The same sequence as Hot Yoga - 15 degrees cooler. This class is for those that enjoy or want to practice the hot yoga series, but in cooler temperatures. Offered three times a week. 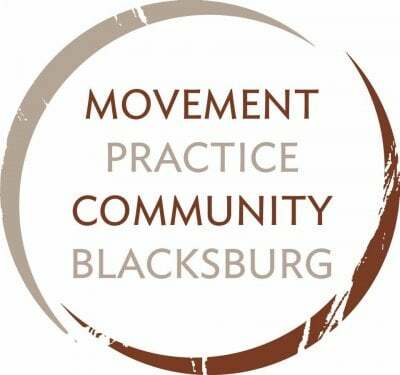 In Balance Yoga is excited to host Cindy Lunsford in Blacksburg again this November 2016. YIN YOGA WORKSHOP: In this 5 hour immersion workshop, we will explore the practice, principles and postures of yin yoga and how they complement and balance an existing Yoga practice. Through discussion and interactive practices (you may take notes during the practices), we will break down yin yoga poses and their modifications and explore the benefits of each one. This workshop is for any level practitioner who would like to explore the quieting and calming practice of yin yoga, as well as teachers who want to expand their knowledge and range of instruction. ARM BALANCING WORKSHOP: No prior experience is necessary! Please just come with and open mind and heart. Cindy will teach us how to incorporate different strength building exercises into our daily yoga practice so that we can slowly and safely work our way into arm balances and inversions. Stay tuned for more information on Cindy's visit and other classes/workshops to be announced with specific details on dates and times. 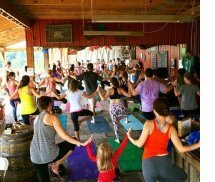 Yoga for All Levels at the Farm Brewery! This is a beginner-friendly, 3 -month series held on the Taproom Patio! Enjoy an outdoor session under the shelter of the barn, followed by a refreshing craft beer, fermented beverage or fresh juice. 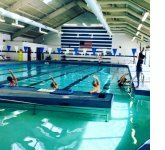 Join us for Community Gentle Pool Yoga at the Blacksburg Aquatic Center. Come have fun doing yoga in the pool. Just bring your suit and a towel, no experience needed.